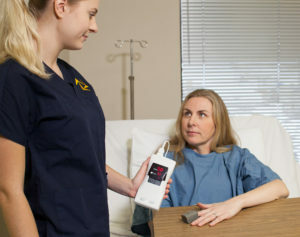 An incorrect technique is demonstrated in Figure 4.6 because the healthcare provider is using the pulse oximeter device on a client who has nail polish on her fingers. Nail polish can affect accuracy, so healthcare providers remove nail polish when pulse oximetry is measured on the fingers. Alternatively, the pulse oximetry could be measured using a device attached to the earlobe. The correct technique is demonstrated in Figure 4.7 in which the nail polish is removed. It is also important to note that healthcare providers need to ensure the radial pulse aligns with the pulse displayed on the pulse oximeter. Finding the Error Activity 2: Pulse Oximetry – Feedback by Ryerson University is licensed under a Creative Commons Attribution 4.0 International License, except where otherwise noted.